A thick, rich, and creamy acai berry bowl full of antioxidant-rich acai berries and raw fruits and vegetables. This Açai Berry Bowl is one of my favorite smoothie bowls. If you’ve been following me on my social media (Instagram, Facebook, and Twitter), then I’m sure you’re wondering about my latest “food phase” – smoothie bowls. I’ve been drinking my Stripped Green Smoothie every morning for many years now, and just with any other breakfast or post-workout meal, we all need to keep it fun and full of variety to continue with those healthy habits established. Herein lies the smoothie bowl to spice things up a bit, which basically is a smoothie thick enough to eat with a spoon! A perfect way to switch up drinking my Stripped Green Smoothie by eating it with a spoon and topped with all kinds of goodies. 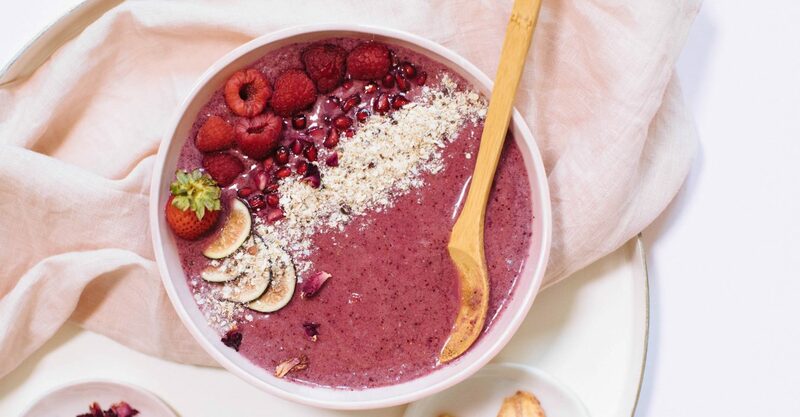 Keep reading for this easy Acai Smoothie Bowl recipe! Açai (ahh-sah-ee) is a berry grown in Central and South America, Brazil and Peru. It’s very rich in antioxidants, minerals, healthy fats, and vitamins. If you’ve never tasted an açai berry, the flavor would be if a cranberry, raspberry, and raisin mixed together to form a new berry breed, Açai would be it. Açai bowls are popular among health enthusiasts and the Brazilian communities (since this berry is grown there). Açai bowls are simply frozen açai with mixed frozen fruits topped with anything your heart desires and eat like a big bowl of ice cream… but with health benefits. What Are The Toppings For An Acai Bowl? Toppings for açai berry bowls are endless! Here I have some of my favorites, unsweetened shredded coconut, goji berries, raw cocoa powder, homemade granola, Nourishing Muesli, and banana chips. Try raw nuts/seeds, fresh fruit, avocado, dark chocolate chips, etc. Although you may have heard in magazines or popular TV shows touting the health benefits of açai reaching as far as reversing diabetes, weight loss, and increasing libido; there is no solid scientific evidence supporting the above statements. What we do know about açai berry is that this low sugar fruit contains many health-related benefits due to the vitamin and mineral content. Not to mention açai is what I consider to be one of many beauty foods as it’s rich in antioxidants, minerals, vitamins (Vitamin C for collagen production and free radical damage), and healthy fats (for skin elasticity, moisture retention, and healthy hormone production). Açai berries contain anti-inflammatory benefits, cholesterol-lowering benefits, and anti-cancer benefits as with many other fruits and vegetables. I purchase açai berry pulp in the freezer section at Whole Foods. You can also try your local health food store or order it online (which would have to be overnighted/packaged with dry ice to keep chilled). A couple other options are the organic freeze-dried powder, SAMBAZON, Nativa’s Naturals, Sunfood, and Acai Roots. Note when using the powders, you will not get the same volume as when using the actual pulp, you will need to add something like frozen bananas to the powder to create this thick frozen yogurt-like texture. I love this recipe for breakfast, lunch, or even dessert! Feel free to add more ingredients into this recipe if you want more of a “meal” such as rolled oats, avocado, more bananas, a favorite protein powder, hemp seeds, etc. Have you ever tasted or used açai berry in your cooking or smoothies? Share below on how you use it! And if you make this at home, share on Instagram with #nutritionstripped so I can see! What Nutrients Are In Acai Berry? Simply add all ingredients into your Vitamix or high-speed blender until thick and creamy. The texture should be very thick, if too thick then add more almond or coconut milk. If you stick a spoon into the mixture the mixture should be able to be thick enough to stay on the spoon, if not add ice or more frozen bananas. Eat after making. Nutrition information is for the recipe as is. Lower calorie/lower sugar: use less banana or add frozen raspberries instead. Higher protein: add protein powder of choice.